The saying goes that nothing in this world is certain except for death and taxes. And rightfully so, the inevitability of death is a prominent fear for many humans around the world. After all, death is universal, mysterious, immutable, and sometimes sudden – and it can shake up life in ways that no other event can. But, as Visual Capitalist's Jefff Desjardins asks: is how we perceive death, along with its common portrayal in media, something that is accurate? Like anything that is shrouded in mystery, death has accumulated its fair share of myths and half-truths that get baked into our stories, perceptions, and societies. Even further, high-profile and tragic events like terrorist attacks, murders, and suicides dominate many aspects of the news cycle. As a result, the causes of death that media outlets are the most fixated on couldn’t be further from actual causes of human death as shown through statistics. And as you’ll see, the data is quite different for each source. We worry about cancer 10x more than we worry about heart disease, but in reality both diseases kill roughly the same amount of people. Meanwhile, the media is fixated on terrorism, homicides, and cancer, but heart disease – which kills more than all put together – receives almost no coverage. 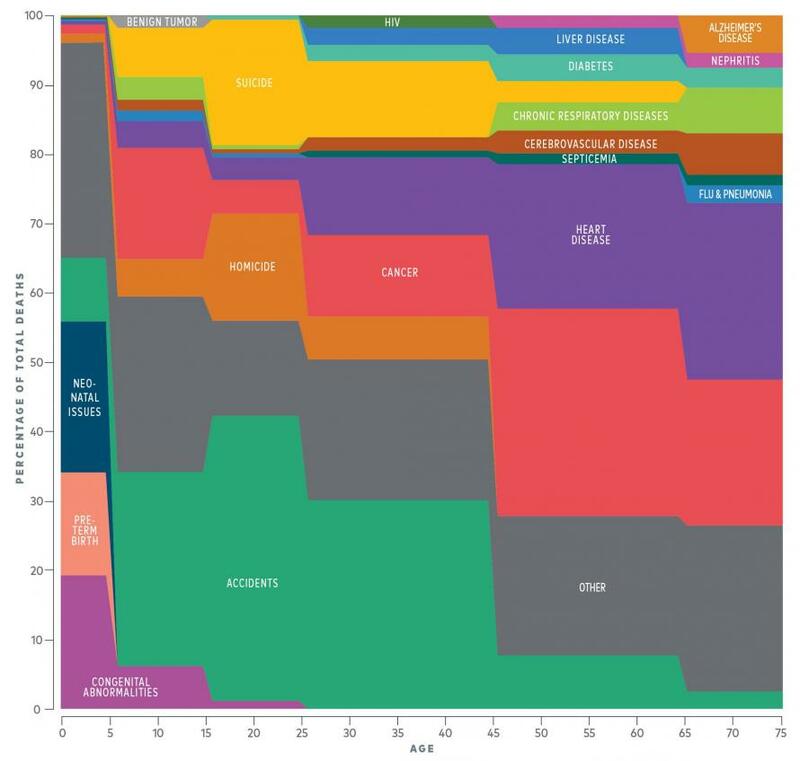 Actual causes of death are quite different from personal and media perceptions, but this data is not absolute either. After all, how someone may die depends greatly upon other factors like age. The data shows that accidents are the leading cause of death for most ages up until 45 years old, at which case cancer and heart disease take over. While the topic of death is grim, the above data and statistics can arguably help provide a more realistic outlook regarding one of life’s certainties. It also shows that humans and media are not necessarily rational about this topic, so it’s important to think about it independently if at all possible.